For the first time in the history of the scientific inquiry of our Sun, a measurement of the solar power in the instant of its production has become possible. The results of this direct measurement by the Borexino collaboration have been published today by the interdisciplinary scientific journal Nature. This important achievement was obtained by detecting solar neutrinos, which are produced by nuclear reactions deep within the Sun, and which then pass right through the Sun, taking just over eight minutes to reach the Earth. Until now, all solar energy measurements were based on light from the Sun's photosphere – the familiar sunlight which lights up our skies and warms the Earth. 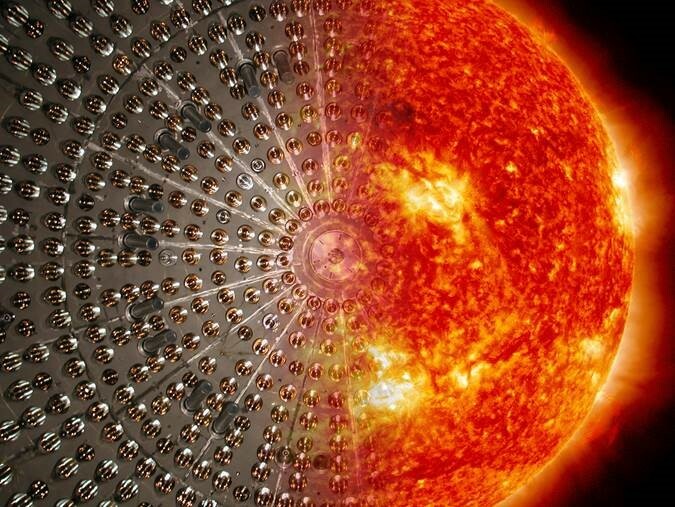 But the energy carried by this sunlight was produced in solar fusion reactions about 100,000 years ago – the average time for energy to percolate from the central regions of the Sun and reach its surface. Comparison between the Borexino measurement and those of the Sun's radiant energy reveals that the solar power has not changed in quite a long time. The Borexino detector, installed in the underground Gran Sasso Laboratory in central Italy, has achieved a measurement of the neutrinos produced in the Sun by the most basic fusion reaction of two hydrogen nuclei (two protons) forming a nucleus of deuterium. This reaction produces about 99 percent of all the solar energy. Before this, Borexino had already measured neutrinos from subsequent nuclear reactions, but these contribute much less to solar energy production. However, these measurements were themselves key to understanding basic properties of this evanescent member of the elementary particles, the neutrino. Measuring the neutrinos from the fundamental proton-proton fusion reaction was especially difficult due to their very low energy, actually the lowest among solar neutrinos, which placed them well below major natural backgrounds. This unique experimental accomplishment became possible by virtue of the advanced technology used in the construction of the Borexino detector, especially its unprecedented level of radiopurity which allows it to study not only the neutrinos emitted by the Sun, but also those produced from our Earth, and even man-made sources. The Borexino experiment is a joint collaboration of several European (Italy, Germany, France, Poland), USA and Russian institutions that encompasses more than 100 physicists, engineers and technicians. The detector will continue its measurements for several years to come. The recently established Borexino group at Johannes Gutenberg University Mainz (JGU) and the Excellence Cluster PRISMA will contribute to this experimental effort, further improving the accuracy of the solar neutrino results already achieved by exploring novel approaches to radioactive background reduction. Moreover, the group is engaged in the new SOX project. This short-baseline neutrino oscillation experiment located at the Borexino detector will perform a sensitive search for sterile neutrinos, new particles outside the framework of the Standard Model of particle physics.